Practice what you preach. Along all te repair jobs stuff comes by that is worth cloning since the original is either hard to get, unaffordable, so crappy in construction or just fun to try.Other than that some stuff which is on the DIY/Bouteek market is way overpriced for the product offered. Other than that I run into ideas myself that are worth giving a try. That doesn't neccessarily mean that the design will make it to it's boxed and for sale status. My archives with non finished designs are far bigger than what you're going to find here. Some of these have taken 10's to hundreds of hours in design time before the conclusion came that it wasn't worth finishing the thing in the first place. Bear in mind that these developments give a lot of experience which is reused in other designs. Good thing is that all D_H bulds are originals in build. 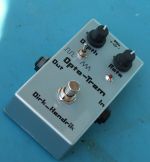 Although the initial circuit may come from something whch has been on the market for years you won't find something like a General Guitar Gadgets design in a D_H tagged box. Nothing to complain about GGG but I don't like the idea of selling someone elses design and hard work as my own. Something that still seems to happen way too often and usually without credits to the designer. All I do is under continuous development. This means that the stuff you see pictured and the stuff you recieve when placing an order may differ. Usually not much though. The development usually goes on inside the box and contains design revisions wich make the effect easier to box, easier to assemble or remove errors made in earlier revisions. 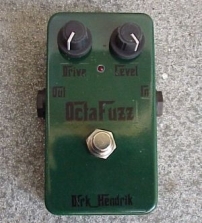 If interested in a Dirk_Hendrik pedal, contact me for pricing info. Please take note I start building when I get a green light. Therefore expect a lead time of about a month. 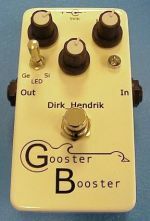 The idea for the GoosterBooster came after Allard Gosens, guitarist for Fat Time and Henkus and often referred to as "the Goose" or "Gooster" was playing one of my never fully finished buids which loosely resembles an MXR dist.+. When thinking about what to do with such a circuit I thought back of the Jet part of a Coron "Jet Flanger & Filter Matrix". 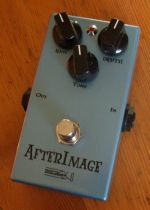 The Jet part, basically a distorting booster runs at 18 volts supply power because of the chips used for the flanger. This provides a lot of possible headroom. Time for some more non-dirt boxes. Heading the chorus way. Added tone control gives either the "warm" chorus or, with increased highs gives a more shimmering effect. Seems this project is taking longer than expected. However, hands are on the design of the last board revision, primarily targetted at removing the last clock bleed. For the perspective of being able to obtain good results from the Coolaudio BBD's... after a lot of cursing, spitting and other not to be mentioned language... they do perform fairly well. 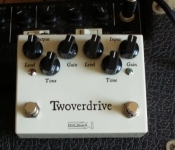 The Twoverdrive is a dual overdrive pedal containing both a Tubescreamer and a Rat. 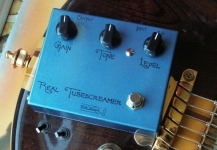 The Real Tubescreamer is the combination of a starved plate tube (12AX7) amplifier stage, creating the distorted sound, followed by a Tubescreamer-like tone control. Simple single channel Optical Amplitude Modulator with 2 modulation waveforms. 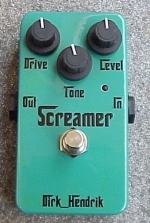 Clone of the famous/notorious Tubescreamer. Some of the most common mods performed on Tubescreamers come standard in this clone. The mods incorported in the changes compared to the original design have the positive point that the reason you're able to hear them. This is not because of the money you paid to have 4 resistors and a cap replaced (setting the modder about 50 cents back while wetting his pants) but because there's something clearly audible happening. Even without sticking your head in the speakers of your combo/cab and then still doubting wether a) you can even hear a change and b) is it an improvement, just a change, or worse. 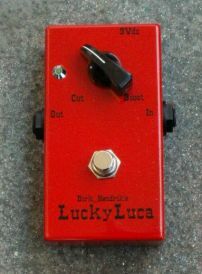 Sillicon Fuzz pedal with added upper octave. Today's effectsmarket is swamped with clean-boosters which all have their specific pro's and cons but more than that,their sonic character. While all of these pedals may sound good better or great they usually have in common that they're all, contrary to their name, clean. They do add either soundshaping or distortion. Boosters they may be, clean they're not at all. Not that there's anything wrong with that... till you get to the point that all is fine but needs just to be louder.